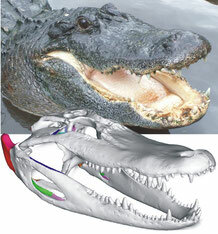 Meet our new 3D model of Alligator trigeminal nerves! We dusted off an old alligator specimen from previous papers and rescanned it at higher resolution to see how well we can tease out finer branches of nerves. Getting there! Next up, higher res, new contrast, more nerves! 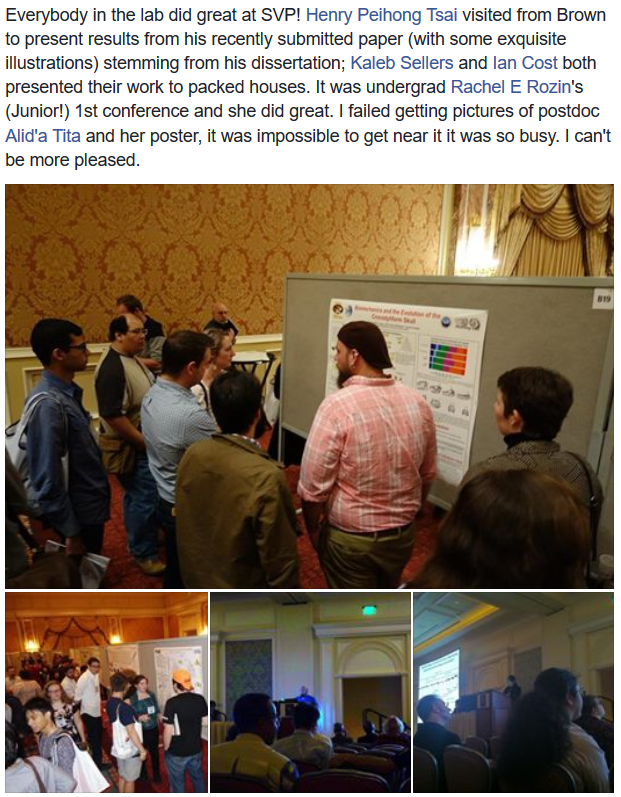 The Holliday Lab had a very solid showing at the Society of Vertebrate Paleontology meeting in Salt Lake City this past week (October 26-29). Past student Henry Tsai presented his latest research on archosaur hips and I presented my latest cranial kinesis models and anaylsis. Kaleb Sellers presented his newest croc data and our undergrad Rachel presented data on avian muscles in poster sessions. 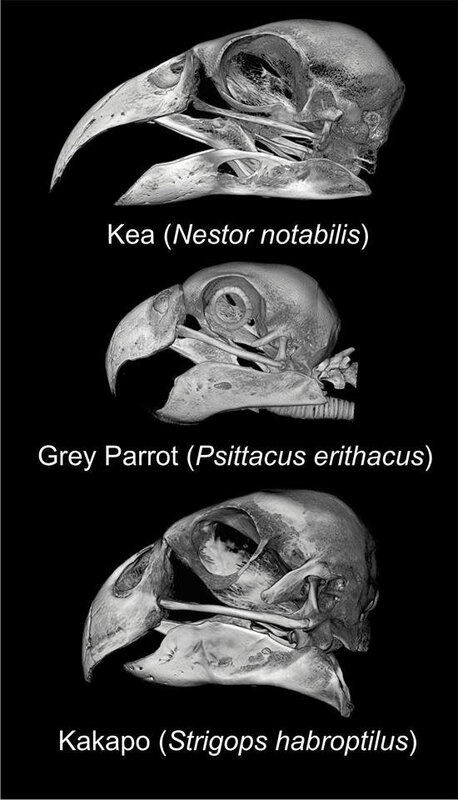 We are currently doing some really awesome things with parrots and CT scans. Stay tuned, this can only get prettier and more fantastic! Specimens at left are on loan from the Field Museum: Kea (FMNH289312) and Kakapo (FMNH23529) and Scott Echols (Grey Parrot). 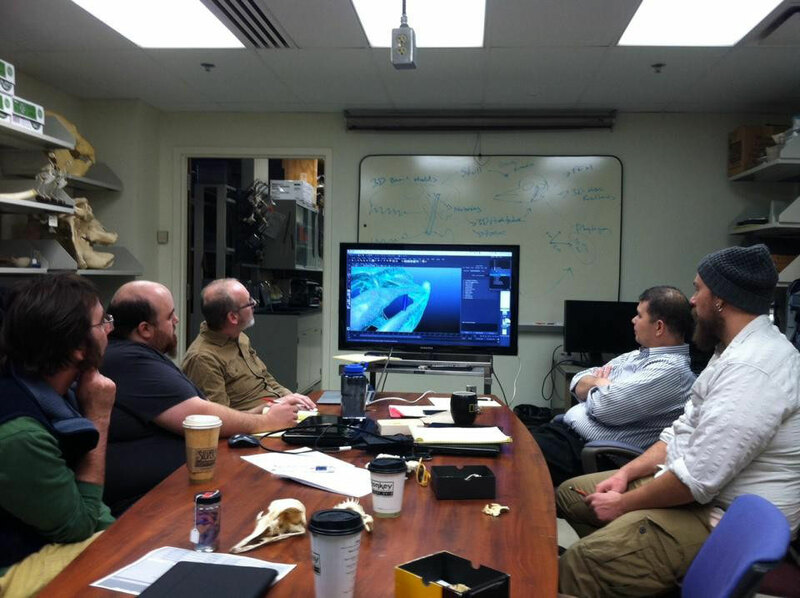 We recently traveled to Austin, TX to share experiences in a workshop focused on contrast-enhanced CT scanning. Research in this area of the field will be updated as it is published/presented! Picture courtesy of Larry Witmer. 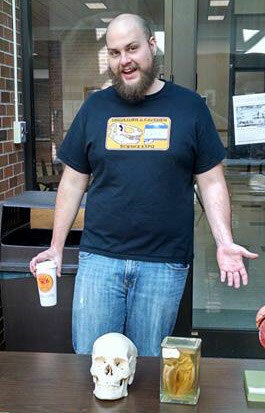 A recommended-for-funding proposal to NSF by Jim Clark, Matthew Carrano, Kaleb Sellers (pictured), and Casey Holliday titled "COLLABORATIVE RESEARCH: Triassic-Jurassic Fossils and the Origins of the Crocodylian Skull" is the news of the day in the lab. A bird related grant (my work in part) is starting to roll and now a crocodile grant in the lab means busy, busy days ahead! 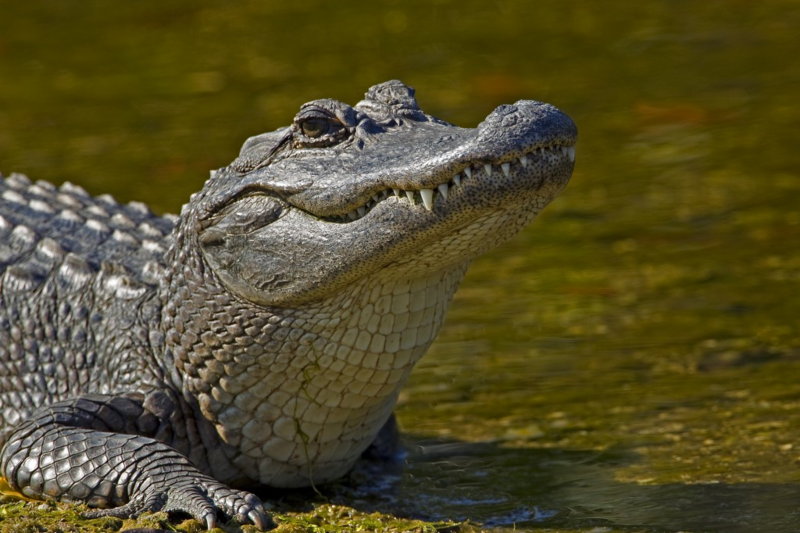 Researchers in the Holliday lab (Casey Holliday and Kaleb Sellers) discovered that alligators have a previously undescribed second jaw joint that helps to distribute the extreme force of their bite - the most powerful of any living animal. Read the Full Story Here. The lab has announced the official publication of its Sketchfab site. 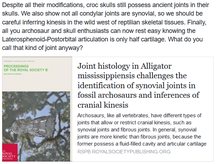 The site's first set of entries is a reimagining of the original alligator skull atlas. This collection of 3D images is informative and educational. It is also pretty. Originally posted by Dr. Holliday: Welcome to the lab, Corrine Cranor! Corrine is a Rock Bridge High School rising Senior interested in paleo, illustration and graphic design. 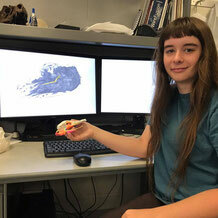 She's spent her first week learning our 3D viz approaches teasing out the finer branches of the trigeminal nerve in some of our diceCT gator data. This summer's undergraduate researchers have done a wonderful job on their projects and they will be presented shortly at the REU Summer Forum. We did a lot of learning, discussing, and science investigation this summer. 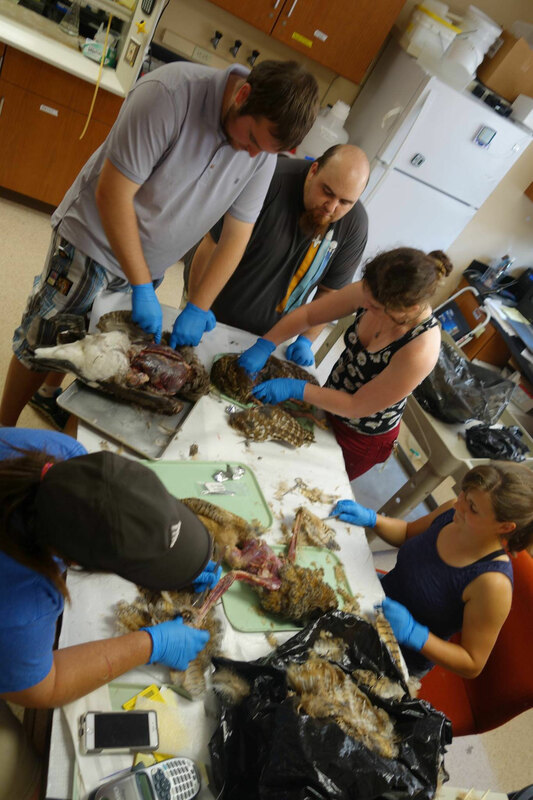 In this photo we are dissecting some birds and learning about their anatomy as a group! In mid-November 2015 our grant team got together in Athens, OH at Ohio University and we worked on the NSF avian kinesis grant. We did a lot of planning, brainstorming, and working with physical specimens that will play a part in the grant. We also did some in silico modeling work that is and will continue to be an integral part of the project. We also had a lot of fun and spent some quality time getting to know one another better. We have a great team and expect great results. Stay tuned, as we are starting to put those results together as we speak.